Yarn is a good therapy for me. And today, i wanted so much to see yarns that I decided to finally search the dreams yarnshoppe in Glorietta 5. They have (of course) relayout their shelves. 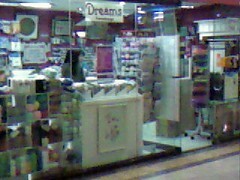 The first time i visited Dreams was when it was still in Glorietta (1 or 2??) And that place was too small and the yarns are stucked up in shelves that i did not much appreciate the store. But this time around, I was in awe. But they are so expensive. I cannot pick much because i am always considering the amount of money I am going to put on resources i might not use. But the people inside were so accomodating, I feel awkward about not buying anything. Well I want to buy! I really do. And mike gave me permission to spend. And that’s good right? Coz he did not tell me the limit. But I wish he did.. sigh. It’s really hard to spend so much money and you’re thinking about paying a 25K cake. They also have the yarns i can buy from baguio and pasig. But of course (quite expensive) than to those I already have. Considering it’s in Glorietta. One (big) ball of baguio yarn costs around P50 to P70 and theirs are around P120. Big difference right? Still I am quite satisfied with my yarn purchase today.